Join the Scott County KFTC chapter as we attend the 2nd ever Pride event in Georgetown, hosted by Georgetown Fairness! We will be there talking about fairness, our work on tax reform, voting rights, voter education, and so much more. Over 1000 people marched in the first ever LGBTQ+ Pride Parade in northern Kentucky! While northern Kentucky has celebrated Pride for the past 8 years, this is the first time in history that the region held a parade as part of the weekend's facilities. Hosted by Georgetown Fairness, the Scott County KFTC chapter and the Fairness Campaign. On Monday allies are expecting people to come out in support of Fairness in Georgetown, and are looking for people to come and share why we need a non-discrimination ordinance here. 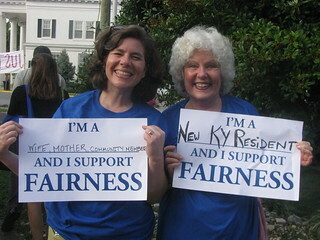 Beginning last October with the inaugural Georgetown Pride festival, members in Scott County have been working with allies like Georgetown Fairness and the Georgetown-Scott County NAACP to gather signatures for a petition asking for a Fairness Ordinance in Georgetown, Kentucky. This petition asked that Georgetown pass an ordinance extending civil rights protections in housing, public accommodation, and employment to include members of the LGBTQ+ community. Allies set and acheived the goal of trying to reach 1,000 signautres by the end of January, and allies delivered their petition to the Georgetown City Council, held a small rally to celebrate the work, and gave comments about the need to pass a Fairness ordinance in Georgetown.